280z SR20DET swapped.. alternator is outputting 17.5v at idle to the battery and has caused the battery to swell and leak all over my bay!! I have the wiring as follows... Large charging cable direct to battery, yellow wire direct to battery with 10amp fuse, Red/White wire to a bulb under the steering column. Bulb illuminates with ignition on, engine starts, bulb goes out (so I'm guessing all that side is good) Dash gauge shows red charging LED illuminated and the voltage is off the scale. Am I missing something here? Everything seems to be wired in properly.. only thing I can think is the regulator on the alternator is shot and a new alternator is required. yellow wire direct to battery with 10amp fuse, Red/White wire to a bulb under the steering column. You seem to have too many "lights". A bulb and an LED. Where did this wiring scheme come from, it's odd? Sounds like the "S" wire is not connected. 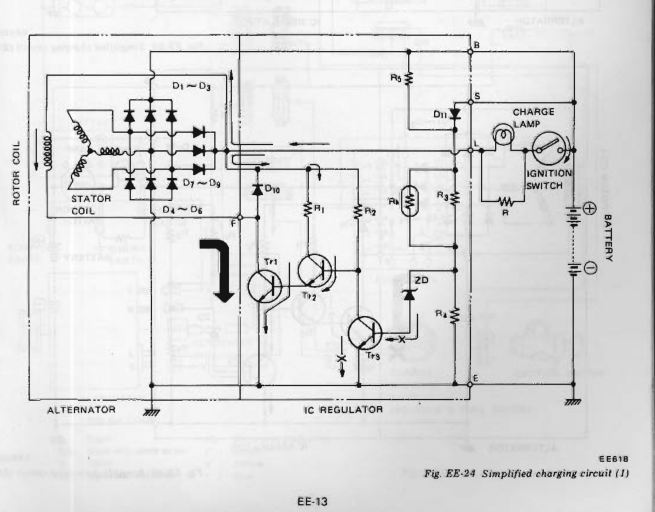 It Senses charge voltage and the regulator uses it to regulate voltage. Your "bulb" must be connected to the L circuit. When it's disconnected the windings lose power and charging stops. Not clear why the gauge has a red LED. Is it the stock gauge or some aftermarket gauge? Is this a new problem or has the wiring scheme never worked? You have some wrongness going on. Ok so... the alternator isn't wired into the 280z loom at all so there could be an issue there somewhere. The conversion and wiring was done by the previous owner so I'm trying to work out whats going on. I have the exact same setup as this guy... seems very strange mine isn't working properly at all! What year 280Z? And do you know if the alternator is internally regulated (it probably is but you never know)? Internally regulated alternators are actually super simple to wire up. S connects to battery/charge wires. L connects to the light in the voltmeter. Sounds like the PO got his S and L backward and rigged some things up to try to make sense of what was happening. Some of the alternators actually have S and L molded into the alternator case. I'd start over and focus on those two wires. The light nthe meter is not an LED. It's just a bulb behind a red lens. He said he doesn't have a charge light. You do. So it can't be exactly the same. Dig in to S and L and forget about wire colors. Use a meter. Here's some good stuff. Diagrams are farther down and S and L are ID'ed. The alts are all similar. Its a stock sr20 alternator so the wiring should match the guides, but I totally agree, start from scratch with the wiring and voltmeter. Thanks for the diagram! Makes things a little clearer... so after some thinking, I'm not even sure that the "lamp" that's currently hanging under the steering column has a resistor on it! That may be the source of the problem right there! So turns out the PO who did the conversion, didn't remove the external voltage regulator!!! I followed AtlanticZ external to internal regulator conversion and sure enough, the OEM regulator was still there. Disconnected the 6 pin plug, started the car and voltage at idle is now 14.5V! I will however be wiring the new alternator into the OEM loom to utilize that charge lamp on the voltmeter. Hopefully this helps anyone else taking on a project! Thanks for your help NewZed. Props! Odd, somebody must have started from basics but overlooked the old system. And never finished the job. Beware, there's a problem with the 280Z's that drains the battery after the Atlanticz method. The brake warning lamp check relay stays on after the swap. 1976 for sure, not sure about 75 and 77. There's another wiring scheme out there but it leaves the Charge light off. There are a few threads around the internet about it. Good luck. Thanks for the heads up buddy! I will leave the car sitting for a few days and see what happens to the battery. I have a jumper pack ready just incase. I also noticed that my car has the "brake" lamp on constantly. I have checked the fluid and the handbrake switch and all seem to be good. Strange one! This happened in my 77. I didn't actually fix the problem, but unplugging the relay under the passenger seat got got rid of that problem. I can't remember what the relay is supposed to do, it might be related to it being a (former) automatic car. I think that that type of thought process is what started his problem. Ok so... after getting it fixed and not driving it since, took it out for a drive and sure enough the OEM alternator regulator was goosed. 14.5v at idle, but rises to 18v when going through the rev range. Replacing it with a new one from a Nissan Serena which is a 90amp alternator. Connectors are in a different place, but the mounting holes seem to be identical. Hopefully getting it mounted up this weekend so will report back when changed. Would ideally love to keep the charge lamp of the OEM loom. Seems the car seriously needs the wiring stripping out and starting again. You confirmed that the S terminal wire shows battery voltage? It's connected to the battery? If it doesn't the new 90 amp will do the same thing. Yes, all checks done. The alternator went for testing, regulator broken! So new alternator in and wired in separately to the atlanticZ wiring conversion and all is good! Back to 14.5v and no more exploding batteries! YAY!